Home buying typically generates a wave of activity as people who purchase homes spend money on improving their homes, installing new appliances, buying furnishings, and other items. Consumer spending data from 2012-2014 shows that home buyers outspend otherwise similar home owners who do not move. During the first two years after closing on the house, a typical buyer of a newly built single-family detached home tends to spend on average $4,500 more than a similar non-moving home owner. Likewise, a buyer of an existing single-family detached home tends to spend over $4,000 more than a similar non-moving home owner, including close to $3,700 during the first year. This article updates a previous study based on 2004-2007 data. The earlier data, collected during the housing boom, showed somewhat higher spending by home owners overall. But the tendency of home buyers to outspend non-moving owners on appliances, furnishings, and home improvements was similar. The standard source of data on consumer spending in the United States is the Consumer Expenditure Survey (CES) conducted by the U.S. Bureau of Labor Statistics (BLS). The CES does not only detail consumer expenditures, it also allows relating this spending to household characteristics such as income, socio-demographic characteristics, and, essential to this analysis, whether these households recently purchased homes. Compared to some other government household surveys, the CES sample is not particularly large - it collects spending data from 6,000 to 8,000 households every quarter – nor is it specifically designed to capture home buyers. To create a meaningful sample of home buyers, this study merges 13 quarters of CES spending data, from the first quarter of 2012 through the first quarter of 2015. This time frame coincides with the period when the housing sector emerged out of a deep recession and new single-family starts and sales were at suppressed and historically low levels. To expand the universe of new home buyers, all homes that were built in 2012 or later are defined as new homes. The created sample roughly reflects the national share of home buyers as captured in the 2015 American Housing Survey (AHS). 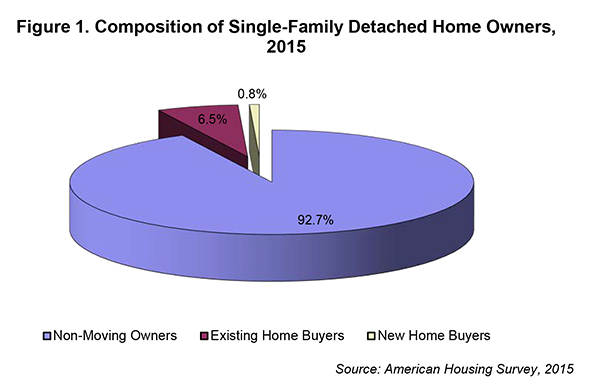 According to the AHS, less than 1 percent of all single family detached home owners bought a new home in 2014-2015 (even though the AHS new homes category includes a broader group of homes - units built in 2010-2015) - and 6.5 percent bought an existing house (see Fig. 1). To analyze spending pooled over several years, all expenditures and income are inflated to 2015 dollars using the Consumer Price Index. Table 1 highlights some of the differences in spending behavior among the three groups of single-family detached home owners: buyers of new homes, buyers of existing homes and non-moving owners. The numbers in the table are average annual spending on various appliances, furnishings and property alterations. During the first year after closing on the house, home buyers tend to spend considerably more on these items compared to non-moving owners. Buyers of new homes spend most: $10,601, outspending non-movers 2.6 times. Buyers of existing homes spend $8,233, twice as much as non-moving owners. Nevertheless, in the aggregate, most of the demand for appliances, furnishings, and remodeling projects in a given year is generated by non-moving home owners, because they outnumber home buyers by such a wide margin. Total appliance spending is highest for new home buyers: $3,094, compared with $1,889 for existing home buyers and $1,182 for non-moving owners. The biggest outlay in the appliance budget of new home buyers are clothes washers/dryers, lawnmowers/other yard equipment, and computer hardware/systems. Coincidentally, new home buyers outspend existing home buyers and non-moving owners on all these appliances. They also outspend non-moving owners on such big-ticket items as refrigerators/home freezers and televisions. The high level of spending by new home buyers may seem surprising considering that many new homes come with installed appliances, but suggests that these purchases are nevertheless more frequent among these households. The Builder Practices Survey conducted by the Home Innovation Research Labs shows that two-thirds of new homes built in 2015 came with no clothes washers and dryers and 36 percent had no installed refrigerators. At the same time, virtually all new homes came with cooking stoves, ranges, or ovens. This is reflected in Table 1, showing that, on average, new home buyers spent nothing on cooking stoves, ranges, microwave ovens or built-in dishwashers. Rather, new home buyers spent most on items that are less likely to be included in the price of new homes. The most expensive appliances in the budget of existing home owners are refrigerators/home freezers, followed by clothes washers/dryers, televisions, computer hardware/systems, and lawnmowers. New and existing home buyers spend even more on furnishings than appliances. During the first year after buying a home, new home buyers spend $3,778 on furnishings, outspending old home buyers 70 percent and non-moving owners 530 percent. The differences are not only large but also most consistent when comparing expenditures on furnishings. Compared to non-moving owners, new home buyers spend more on every single item the CES counts as furnishings with the exception of infants furniture and other furnishings. They also outspend existing home buyers on nearly all furnishing items with the exception of office furniture, dinnerware, and infants equipment. A home purchase, especially when it is a new home, has a particularly large effect on expenditures on living room chairs/tables and dining room/kitchen furniture. During the first year after moving, new home buyers spend $687 on living room chairs and tables, outspending non-moving owners and existing home buyers 12 and 5 times respectively. The average spending by new home buyers on dining room and kitchen furniture is $345. This is 12 times higher than the amount spent by non-moving owners and exceeds the respective spending of existing home buyers nine times. The differences in spending patterns are similarly large when comparing spending on window coverings. New home buyers outspend non-moving owners 10 times ($215 compared to $21), while existing home buyers (with an average annual spending on window covering of $78) outspend non-moving owners 4 times. The biggest ticket item for new home buyers is sofas, with an average spending exceeding $700 during the first year after moving. This is 60 percent higher than the amount spent by buyers of existing homes and 6.4 times higher than what non-moving owners typically spend on sofas per year. The largest furnishings outlay for buyers of existing home and non-moving owners is bedroom furnishings, including mattresses and springs. Non-moving owners spend $151 on bedroom furnishings in any given year. During the first year after moving, old home buyers spend $519 on these items. For buyers of new homes, this expenditure goes up even higher to $634 during the first year after moving. This is not surprising, considering that the number of bedrooms in new single-family detached homes has been on the rise. In 2016, three, four and more-bedroom houses accounted for 91 percent of all new single-family detached homes compared to only 75 percent in 1985, according to the U.S. Census Bureau. Buyers of existing homes spend $4,085 on property alterations and repairs, compared to $3,729 spent by new home buyers, and $2,232 spent by non-moving owners. Considering that new home buyers move into new homes, it might be surprising that they spend almost as much on property alterations and repairs as buyers of existing homes, but the specific types of remodeling projects are quite different across the groups. Considering that many new homes come with warranties, it is not surprising that new home buyers spend virtually nothing on various repairs and replacements. At the same time, existing home buyers spend more than new home buyers on every single item the CES lists as a repair or replacement, with the exception of HVAC repair. They also outspend new home buyers on kitchen/bathroom addition or remodeling, and purchasing and installing new items such as HVAC, plumbing, electrical and security systems, paneling, flooring, siding, windows and doors. Average spending of new home buyers on most of these items is close to nothing, suggesting that new home buyers rarely spend on these items during the first year after moving. However, when it comes to outside additions and alterations, including a new driveway, walk, or fence, new home buyers outspend existing home buyers and non-moving owners by far. Non-moving owners outspend home buyers on most replacements, as well as repairs of doors, windows and skylights. Table 1 clearly illustrates that there are substantial differences in how much home buyers and non-moving home owners spend on appliances, furnishings and property alterations. However, these differences in spending patterns cannot be fully attributed to a home purchase. Home buyers and non-moving owners might have different income, education, tastes, preferences, and other socio-demographic characteristics that could potentially explain differences in their spending behavior. Table 2 demonstrates that there are indeed differences between home buyers and non-moving owners. Home buyers tend to be larger households with children, and on average wealthier, better educated and concentrated in urban areas. Any of these factors could potentially contribute to higher spending on appliances, furnishings and remodeling. To control for the impact of household characteristics on expenditures, a statistical model was used. The analysis confirmed that household characteristics influence spending levels on furnishings, appliances, and remodeling. It also proved that a home purchase alters spending behavior of home owners and that otherwise similar home owners spend more across all three categories during the first year after buying home compared to non-moving owners (for readers interested in technical details, the statistical output is presented in the appendix of the article). The analysis also showed that the higher level of spending on furnishings tends to persist for two years after households move into an existing home. In case of buyers of newly built homes, spending on appliances, furnishings and remodeling tend to come back to normal level after the first year in a new home. To illustrate the impact that a home purchase has on spending and to control for differences in socio-economic characteristics of home buyers, the statistical estimates can be used to predict spending levels of identical households that differ in only one way: one household buys a home and the other stays put in a house they already own. 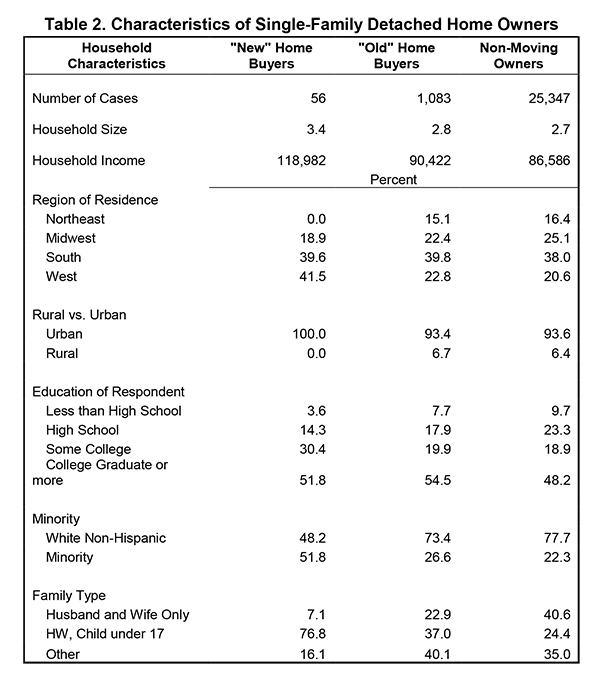 Table 3 presents estimates for households that have socio-demographic characteristics typical of a new home buyer. The first column shows predicted spending levels of this “typical” new home buyer who buys a new home, and the second column contains estimates for an identical home owner that stays put. The last column captures differences in spending levels attributed to the purchase of a new house, controlling for differences in the household characteristics shown in Table 2. The differences are largest on furnishings, close to $2,500 during the first year after closing on a new house. A typical new home buyer is also estimated to spend $1,258 more on appliances during the first year. In case of property repairs and alterations the differences are smallest: $714. Overall, during the first year after purchasing a new home, a typical new home buyer tends to boost spending on appliances, furnishings, and property alterations by additional $4,455 as a result of buying a new home. Table 4 presents results of a similar comparison for home owners with characteristics typical of an existing home buyer. Over the two years after the move, the “typical” buyers of an existing home tend to increase their spending on remodeling, furnishings, and appliances by over $4,100, compared to otherwise identical home owners who do not move. Remodeling projects account for half of this extra spending and mostly occur during the first year after closing on the house. Only the additional spending on furnishings tends to persist beyond the first year. A legitimate question is whether a higher level of spending on furnishings, appliances and property alterations is achieved by home buyers by economizing and cutting their spending on other items, such as entertainment, apparel, transportations, travel, food at home, restaurants meals, etc. The identical statistical model was used to test this hypothesis. The statistical analysis showed that while income and socio-demographic characteristics help explain household spending on other items, a home purchase does not suppress spending on entertainment, apparel, transportation (including spending on new and used cars and trucks), food at home and restaurant meals. Overall, a home purchase does not have a significant effect on other spending outside of the added property alterations, appliances, and furnishings. Thus, home buyers do not in general seem to pay for the three considered categories by economizing in other areas of spending. It is important to keep in mind that the averages reported in Table 1 are averages for all households in the group regardless whether they purchased a certain item/service or not. Thus, these averages are considerably lower than the expenditure by those households that actually purchased the item. The less frequently an item is purchased, the greater the difference between the average for all households in the group and the average of those purchasing. The particular technique is called Tobit regression analysis. This technique was selected because there was a large number of zero expenditures in the sample corresponding to households that reported no spending on either appliances, furnishings, or remodeling projects. In such cases, the traditional regression analysis (OLS) is known to produce biased estimates. To capture the effects of the CES sample design, the Tobit regressions were run within the balanced repeated replication (BRR) framework where target statistics are repeatedly re-estimated using half-sample replicate weights.